While Urban or suburban dogs are largely confined, the same is not true for your country dog. Country dogs have more freedom and spend their days exploring the hills, pastures and creeks nearby. 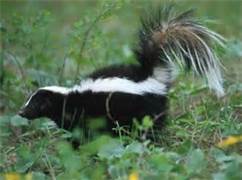 Sooner or later your family pet will be on the wrong end of the country skunk. No matter how hard you try to protect your favorite canine, there curiosity will end up with them in one big aromatic mess. As their caregiver we will have to fix the problem. And let me tell you it is hard to snuggle up with your beloved companion when they have been “SKUNKED”. Below you will find an easy remedy that will help fix the problem!